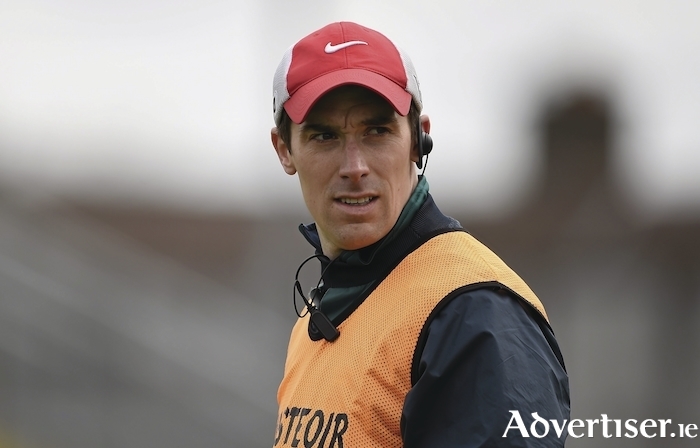 Man on a mission: Mike Solan will be looking to guide his Mayo u20 side to a Connacht title on Sunday. Photo: Sportsfile. While the seniors will not be there, the Mayo u20s victory over Leitrim last Saturday ensured there will be some Mayo interest on Connacht final day in Hyde Park on Sunday afternoon. Mike Solan's side swatted away the challenge of Leitrim in their semi-final last weekend with ease, running out 1-24 to 1-3 winners in MacHale Park with Ross Egan bagging 12 points along the way and Oisin McLoughlin netting Mayo's goal just before the 20-minute mark. The Mayo full forward line of Egan, Tommy Conroy and John Gallagher contributed 16 points on the day, with sub Colm Moran chipping in with two following his introduction 18 minutes from the end. Mayo could have pushed their lead out even further before the end with Ryan O'Donoghue missing a penalty in the second half; all in all though Solan will be very happy with his side's return from the game with ten different players getting on the scoresheet. This Sunday's meeting between the two sides will offer some of these Mayo players a chance to gain some revenge on a Roscommon side that inflicted a big beating on Mayo when they met in the Connacht minor league two years ago. Roscommon put that Mayo side to the sword on a 2-20 to 1-3 scoreline, with Mayo’s total arriving in the opening 18 minutes of the game before Roscommon took control. Belmullet attacker Ryan O’Donoghue, Jordan Flynn, Patrick O’Malley and Donovon Cosgrove were all missing for Mayo that night in Bekan and are now leaders on the u20 side. Adam Byrne, John Cunnane, Paul Lambert, Conor Hunt, Johnny Maughan, Evan O’Brien, Colm Moran, Oisin McLoughlan, Tommy Conroy and Ross Egan all tasted action in that year’s Minor League encounter and have not let the experience sully them as they go in search of victory over the same side on Sunday. Roscommon for their part booked their place in the final with a hard fought 1-11 to 0-11 win over Galway in Tuam Stadium last Saturday, with full forward Cian McKeon kicking seven points for his side and wing-forward Dylan Ruane bagging the vital goal eight minutes into the second half. Roscommon played with a man advantage for most of that game after Finian Ó'Laoi was shown a straight red card eight minutes in, but they still only managed to go in level at the break at five points a piece. The eventual winners' greater numbers showed in the second half as the stretched out to a 1-9 to 0-7 lead by the 45th minute; Galway did fight back in the closing stages that saw one man from each side sent to the line, but Roscommon held on for the win. Mayo will be going into the lion's den on Sunday as this game is on the undercard of the hotly anticipated meeting of Roscommon and Galway in the senior final.